ENTRANCE HALL Opens into a spacious central hallway with stairs to the first floor. GUEST BEDROOM 13' 9" x 9' 2" (4.20m x 2.80m) Suitable for a variety of uses but envisaged as a guest bedroom in conjunction with the downstairs shower room. SHOWER ROOM 10' 9" x 4' 7" (3.30m x 1.40m) With contemporary 3 piece suite. UTILITY 9' 2" x 8' 6" (2.80m x 2.60m) With fitted units. DOUBLE GARAGE 24' 7" x 16' 4" (7.50m x 5.00m) A large double garage with additional storage. LANDING With window to the side and stairs continuing to the first floor. LOUNGE 16' 8" x 13' 5" (5.10m x 4.10m) A stunning living room which features glazed folding doors opening onto the balcony and enjoying the views to the front. KITCHEN 16' 8" x 10' 9" (5.10m x 3.30m) A generous kitchen with high quality finish, open plan into the living / dining area. LIVING / DINING 16' 4" x 14' 1" (5.00m x 4.30m) With glazed double doors opening into the garden, rooflights to the partly angled ceiling. FAMILY ROOM 13' 9" x 9' 2" (4.20m x 2.80m) A further living room which could be suitable for use as a sitting room, playroom or office. BEDROOM 1 13' 9" x 11' 9" (4.20m x 3.60m) The master bedroom features a walk in dressing room area. ENSUITE 6' 6" x 5' 10" (2.00m x 1.80m) With contemporary 3 piece suite. BEDROOM 2 13' 9" x 9' 2" (4.20m x 2.80 (3.00m max)m) A double bedroom with windows to the front. BEDROOM 3 11' 9" x 10' 5" (3.60m x 3.20m) A double bedroom with windows to the rear. BEDROOM 4 13' 1" x 8' 6" (4.00m x 2.60m) A double bedroom with window to the rear. BATHROOM 8' 6" x 6' 6" (2.60m x 2.00m) With contemporary 3 piece suite. 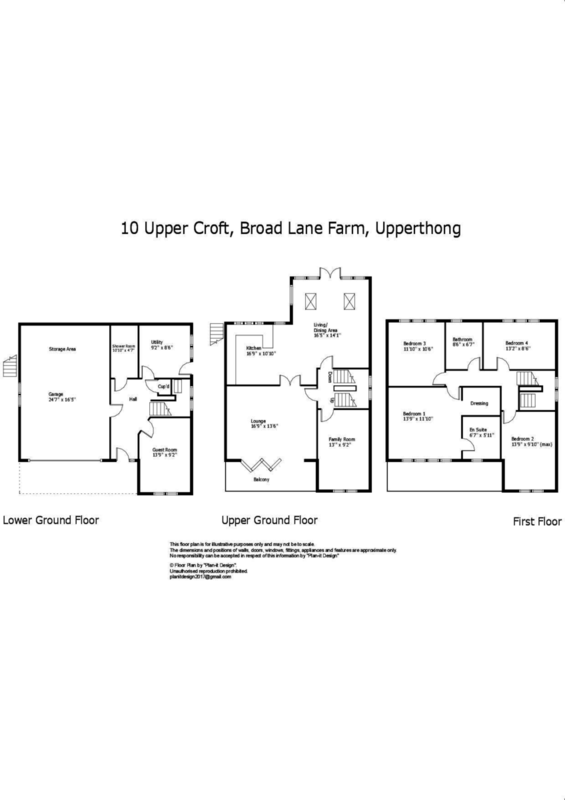 SPECIFICATION Feel assured that every home at Broad Lane Farm will be finished to the highest standard using only the best, high quality materials throughout. Our attention to detail in both the design and construction means this is no ordinary new build, it's your home and one you can be truly proud of. EXTERNAL 	Tumbled and dyed natural stone walls with natural stone headers, sills, jambs and mullions. 	Marley Eternit Edgemere Riven roofing tiles. 	Contemporary anthracite grey woodgrain uPVC windows and doors with satin chrome ironmongery. 	Anthracite grey sectional garage doors (automation available). 	Black uPVC guttering and downpipes. 	Brushed stainless steel exterior lighting. 	Tumbled block paving to house driveways. 	Hit and miss privacy fencing to gardens. 	Sandstone effect riven paving to paths and patio. 	Low level hedging to front gardens. 	Native feature trees to front and rear gardens. KITCHEN 	Stunning contemporary Siematic kitchens incorporating soft close drawer system. 	Solid quartz worktops and upstands. 	Neff 4 zone induction hob. 	Neff integrated stainless steel multifunctional oven. 	Neff built-in combination microwave oven. 	Zanussi integrated fridge freezer and dishwasher. 	Integrated under counter wine cooler. 	Under unit LED lighting. BATHROOMS AND WC 	High quality, cutting edge NU sanitaryware throughout supplied by the local experts; Easy Bathrooms. 	Contemporary Gemini built-in bath with chrome mixer tap. 	CARA illuminated demister LED mirror to house bathroom. 	Striking grey metallic heated towel rails to house bathroom and ensuite. 	The latest luxury porcelain tiles to walls (half height as standard) and floors. 	Walk-in shower units featuring chrome TORINO thermostatic overhead shower. HEATING AND ELECTRICS 	High efficiency gas fired boiler and central heating throughout. 	Thermally efficient, mains pressure high capacity hot water cylinder. 	Television cabling and sockets to all bedrooms, kitchen and lounge. 	CAT 6 cabling throughout allowing for seamless data distribution. 	Security alarm, mains smoke and carbon monoxide detectors and wired front door bell all as standard. 	Satin chrome socket and switch covers throughout (white plastic socket covers to bedrooms). 	All downlights in brushed chrome. FINISHES AND FITTINGS 	Contemporary ash staircase with glass balustrading. 	Stylish white oak veneered internal doors with satin chrome ironmongery. 	Quality carpets to all stairs, lounge and bedrooms. 	Engineered timber flooring to entrance halls. 	Stylish porcelain floor tiles to family kitchens. 	Heritage off-white emulsion to all internal walls. WARRANTY All homes come with LABC 10 year structural warranty as standard for complete piece of mind. CUSTOMISATION AND UPGRADES Holroyd Homes want your home to be just right and a true reflection of you and your family. They would therefore love you to get involved and put your unique stamp on things. The following customisation comes as standard (build stage dependent); wall tiles, floor tiles, carpet colour, kitchen colour and choice of worktop, internal doors and engineered wood flooring (where included). Please don't hesitate to get in touch with us at Wm Sykes & Son to discuss this further. VIEWING By appointment with Wm Sykes & Son. LOCATION From the centre of Holmfirth take the A635 Greenfield Road to Comp's fish restaurant. Turn right onto Parkhead Lane, turn left onto Broad Lane and continue up the hill. Broad Lane Farm will be found on the right hand side.